The expo is showcasing products produced by 219 companies from 11 countries on an area of over 129 thousand square feet (12,000 square meters). Participants include Russia, the US, the UK, France, Germany, Italy, Belgium and among others. The companies are showing off some of their newest craft. Russia’s Heliwhale is unveiling the never-before-seen Afalina, a light coaxial rotor helicopter that can be used for training, police patrols, private transport and a variety of other functions. One of its key features is the customizable Enigma system, which allows the pilot to pick and choose his cockpit display layout from hundreds of devices and functions. The Afalina is aimed to be as cost-effective as possible. 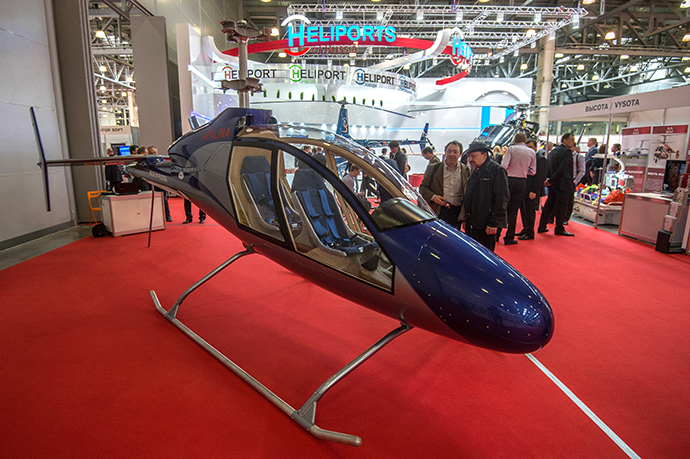 “The fact that it is produced in Russia and the combination of technologies it employs significantly optimize the cost of flying, which allows the helicopter to be used for a wide range of purposes,” HeliRussia organizers told the media, RIA reports. American Bell Helicopter has brought its Bell 505 Jet Ranger X, a light craft still under development, which it hopes to sell on the Russian market. 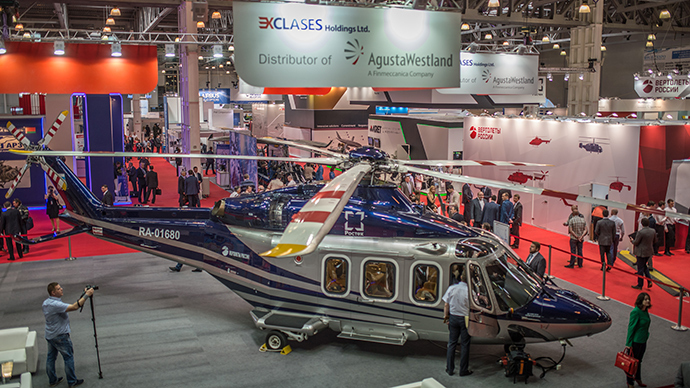 Italy’s AgustaWestkand showcases the AW189, a multipurpose medium-lift helicopter that has been in operation for just one year. Russian Helicopters also hopes to interest international clients in buying its updated version of the venerable Mi-8, which is one of the world’s most widely used helicopters. The new Mi-171E features a “glass cockpit system” allowing it to fly in any weather at any time of day. The company also showcases the multipurpose Ka-226, which is capable of climbing to altitudes of up to 24,500 feet (7,500 meters), and is resistant to side wind. Last year, Russian companies sold over 100 helicopters worldwide, Air Force export department head Vladislav Kuzmichev said in a press release. He said the military transport Mi-17 remains the most popular purchase, but hopes to find buyers for attack models as well. “We are certain our new helicopters - the combat Mi-28 and Ka-52 - will take a rightful place in the order portfolio,” Kuzmichev said. Russian Helicopters’ Mi-28 Night Hunter (NATO reporting name Havoc) has been deployed by the Russian Air Force since 2013, and the Ka-52 Alligator (Hokum B) since 2011.